Craving more wicked good spy movies like Atomic Blonde? Check out 10 more must-see flicks that take action & excitement to a whole new level! If you checked out our trivia and quotes post, you already know that Atomic Blonde is a 2017 movie that features action, spy and thrills. It is set to hit theaters on July 28, 2017 and is based on the 2012 book titled The Coldest City, written by Antony Johnston. 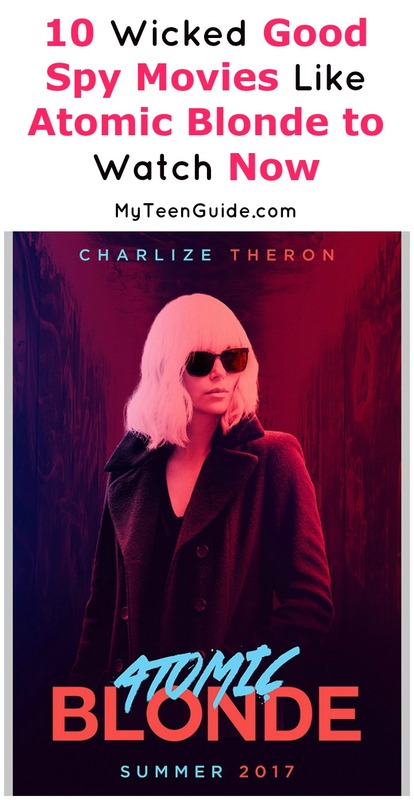 Check out the trailer, then read on for some other great movies like Atomic Blonde. Charlie’s Angels is a 2000 action comedy movie that is based on the television series, of the same name, which aired for 5 seasons on ABC, from 1976 to 1981. The movie is the prequel to the 2003- Charlie’s Angels: Full Throttle. Natalie Cook, Dylan Sanders and Alex Munday are employed as private investigators for Charlie Townsend. The movie stars Cameron Diaz, Drew Barrymore, Lucy Liu and John Forsythe. Since Atomic Blonde was nicknamed Jane Wick by fans, it makes sense that John Wick would be on this list! The 2014 movie stars Keanu Reeves as the title character, a former hitman who comes out of retirement to seek revenge on the person who stole his car and, worse, killed his puppy. The movie also stars John Leguizamo and Willem Dafoe. The sequel, John Wick: Chapter 2, released in June. Die Another Day is a 2002 spy movie. It is the 20th film in the James Bond movie series, with the most recent (#24) being 2015- Spectre, starring Daniel Craig. James Bond, an MI6 spy, heads to North Korea on a mission, only to find himself captured and tortured by North Korean soldiers. The movie stars Pierce Brosnan. Mr. and Mrs. Smith is a 2005 action comedy movie. John and Jane Smith are a married couple who work as contract killers for competing firms. The movie stars Brad Pitt and Angelina Jolie. Get Smart is a 2008 action comedy movie that is based on the television series, of the same name, which aired on NBC and CBS for 5 seasons, from 1965 to 1970. Maxwell Smart is an CIA analyst, who dreams of being a field agent. The movie stars Steve Carell. Quantum of Solace is a 2008 spy movie. It is the 22nd movie in the James Bond film series, with the 1st one being 1962- Dr. No, starring Sean Connery. James Bond, a spy with the British Secret Service, seeks revenge for the death of his former lover, Vesper Lynd. The movie stars Daniel Craig. Inglourious Basterds is a 2009 war movie. The movie showcases the fictional history of two separate plots to assassinate Nazi leaders, including Adolf Hitler. The movie stars Brad Pitt and Melanie Laurent. Fair Game is a 2010 biographical political drama movie. It is based on 2 books: 2004- The Politics of Truth: Inside the Lies That Led to War and Betrayed My Wife’s CIA Identity- by Joseph C. Wilson and 2007- Fair Game: My Life as a Spy, My Betrayal by the White House- by Valerie Plame Wilson. The movie stars Sean Penn and Naomi Watts. Salt is a 2010 action thriller movie. Evelyn Salt, a CIA agent, tries to clear her name after she is accused of being a Russian spy. The movie stars Angelina Jolie. Spy is a 2015 action comedy spy movie. Susan Cooper, a CIA office analyst, goes undercover to try and stop the sale of a suitcase nuke on the black market. The movie stars Melissa McCarthy. With a great mix of action, adventure, thrills and even a little comedy, these 10 movies like Atomic Blonde should keep you plenty busy until the movie releases! It’s hard to say which one is my favorite. I really loved Mr. and Mrs. Smith, but you can also never go wrong with a good James Bond movie! Do you have any other favorite action movies like Atomic Blonde? Share below!